MATCO mfg's parking brake valve has been designed with the pilot's needs in mind. Its light weight, and easy in-line installation make it an ideal choice for home builders who desire this important option in their aircraft. The overall dimensions of this product are a slim 2.3" X 1.50" X 0.75". The new PV-D parking brake valve features high quality components including industrial springs for lasting compression, buna n o-rings for a leak-proof seal, and standard size fittings utilizing a tapered pipe thread which attaches easily to most other fittings. The body of the PV-D is black anodized aluminum for corrosion resistance and long life. The lever arm and cam shaft have been heat treated and plated to ensure hardness and provide smooth operating efficiency within the actuating range. The PVPV-D works as a dual system resetable check valve. When the lever is moved to the closed position, fluid can flow to the brake but not return. The lever may be positioned prior to pressure being applied or when pressure is applied. The longest o-ring life is achieved by reapplying the brake pressure when the lever is moved to the open position but equalization is not required prior to release. Linear flow through body provides compact installation and easier bleeding than valves with a 90 degree flow turn in the valve. Innovative body design allows installation of any combination and orientation of straight, 45, or 90 degree fittings. As a result, the hydraulic routing approach to the valve is infinitely flexible. Since the body is symmetrical, the lever can be positioned on the left or right side by simply flipping the valve. No need to disassemble the valve to relocate lever. 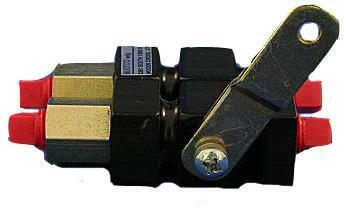 Lever handle can be repositioned in 90 degree increments to change valve operating zones. New internal design improves robustness and ease of installation. One hundred percent of all parking brake valves are pressure tested to a minimum of 1200 PSI and are subject to a rigorous testing procedure to ensure the highest quality and maximum reliability of this product. MATCO mfg can supply all of the necessary supplies including fittings, brake line tubing to install this parking brake valve today.